VAN DOOREN J & JANSEN JJFJ (2018) Bernardus van Dooren (1908-1988), an egg collector in the Brabantse Kempen. 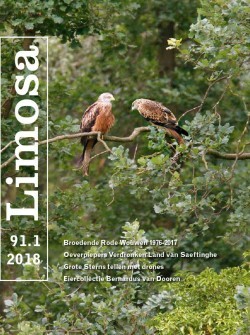 LIMOSA 91 (1): 38-43. Historical egg collections are informative about the local breeding community occurring at that time. Bernadus van Dooren registered information on 5087 nests in 1932-1977 in the Brabantse Kempen in the South of the Netherlands. 693 nests of 150 species were collected. Van Dooren was specifically interested in egg colour variation, and he only collected nests of the same species if the eggs had a different colouration. Van Dooren was also one of the pioneers of bird ringing. In total he ringed 55 811 birds (12 604 nestlings and 43 207 full grown birds). Several of the species Van Dooren encountered have disappeared from this region or even went extinct in the Netherlands. Noteworthy to mention are Black Grouse, Little Bittern, Ruff, Montagu's Harrier, Tawny Pipit, Crested Lark, Red-backed Shrike, Ortolan Bunting and Corn Bunting.